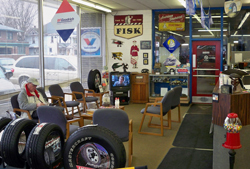 Anderson Indiana's best choice for tires and auto service! When Tom Parker started T & J Tire and Auto Service in 1982 he already had 25 years of experience in the tire business. These days Tom’s son Jeff Parker, himself with over 30 years in the business, carries on the family tradition of quality work and great service at T & J Tire. Whether you need tires or service for your auto or truck T & J Tire will give you fast service with competitive pricing on great products. We have a vast array of quality professional equipment and an average of two decades of tire and repair experience per person on our staff. Here at T & J Tire and Auto Service we can handle your routine auto and truck service and maintenance needs as well as repairs. We will be happy to work with you to get the perfect tires or wheels for your classic car or hot rod. As you can tell from our show room, we are fans of classic cars too! We are conveniently located near the heart of Anderson at 9th and Jackson streets and we offer a shuttle service for our customers. 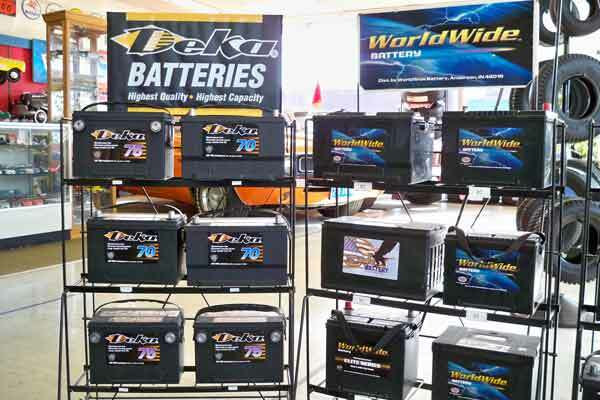 We carry these top brands: Bridgestone-Firestone, MasterCraft, Fuzion, and Goodyear. You can have us special order just about any brand or size of tire you might need. Our line includes specialty tire needs for “Hot Rods”, “Classics” and “Muscle Cars”. At T & J Tire, we not only source these tires for you at a competitive price but we have the special equipment and experience needed to properly mount aluminum and custom wheels. 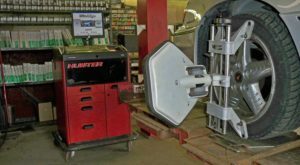 We can handle rims up to 20” and we can handle all issues related to the TPMS such as diagnose issues, replace stem, reprogram, reset, re-learn. At T & J Tire we can handle your routine auto and truck service and maintenance needs as well as repairs. We will be happy to work with you to get the perfect tires or wheels for your classic car or hot rod. As you can tell from our show room, we are fans of classic cars too! T & J Tire can handle routine auto service and maintenance like oil changes, batteries and windshield wipers. 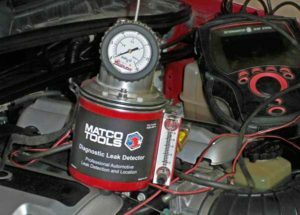 We do engine diagnostics and tune-ups, heating and air-conditioning system service, auto electrical service, radiator flushes/fills and more. You should have your vehicle’s wheels aligned every year or when you get new tires. The pot holes are bad this year so your car or truck’s wheel alignment may have been knocked out. Bad alignment of your car or truck’s wheels causes poor and uneven tire wear and hurts your fuel mileage. Poor tire wear is also costly because you have to replace the tire(s) sooner and potentially dangerous as it can affect how the vehicle handles. T & J Tire can handle routine brake service and repairs to pads, calipers, rotors and brake lines. When your brakes start to chirp, they are telling you something! Brakes are designed to make a high pitched “chirping” noise when the brake pads are wearing thin. This sound alerts you to the fact that you need to have your brakes serviced soon. T & J Tire can handle anything from minor to major engine repair. We do engine tune-ups, heating and cooling system service, radiator flushes and fills and more.